St. Joseph County, founded in 1830, is celebrating Indiana’s bicentennial by reminding residents of their county’s history. Evie Kirkwood has been the director of St. Joseph County’s parks for 13 years. In addition to that role, Kirkwood was also one of three county coordinators for the Torch Relay. “The role of the county parks, first of all, is to provide and care for significant natural areas within the county and then to offer programs within those properties that highlight the natural resources and allow people to enjoy and explore the outdoors,” Kirkwood said. As Kirkwood and her team looked at the relay route proposed by the State of Indiana, they realized that the torch would travel alongside but not through Bendix Woods County Park, the last stop on St. Joseph’s County’s route. They applied for a variance to get the torch to come through the park, and that park is now where the torch will be handed off to LaPorte County and the Bicentennial Birthday Bash will take place throughout the park. Bendix Woods County Park, originally acquired in 1966, was the first St. Joseph County park incorporated into their system. This means that 2016 is also St. Joseph County Parks 50th anniversary. Bendix Woods has trees to commemorate the Studebaker Corporation that used to operate in the county. They built a three mile oval track and other roads and paths that were used as a testing ground for Studebaker vehicles. When the corporation closed, the land was purchased by the Bendix Corporation, who then carved out 175 acres of that land. The land includes 13 1/2 acres of pine trees that spell out Studebaker. A two-story brick building, originally known as the Studebaker Clubhouse, also sits within those 175 acres. It now houses offices and a park nature center. “The Studebaker trees and that Studebaker Clubhouse are both on the National Register of Historic Places, and when the torch comes in on Saturday to the park, it will pass alongside the former Studebaker clubhouse and alongside those Studebaker trees,” Kirkwood said. Having the park’s 50th anniversary and Indiana’s bicentennial in the same year has been “fun and exhausting” for Kirkwood. The Bicentennial Birthday Bash is a celebration of both. 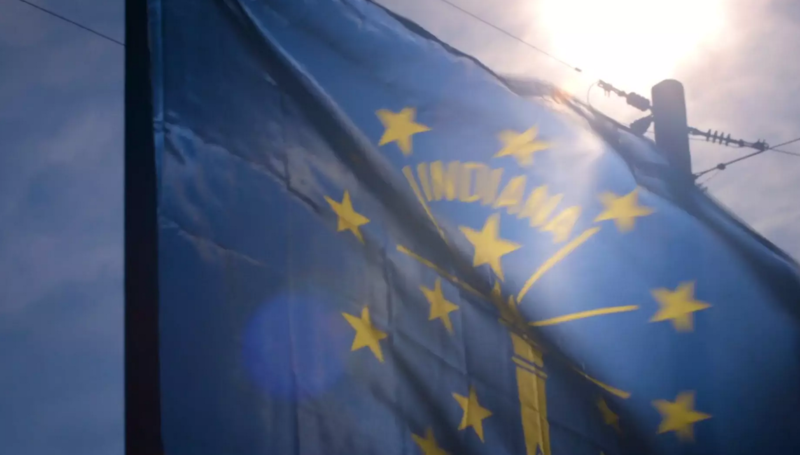 “I think, first and foremost, it’s just a way for everyone to celebrate our heritage, our history, our community, our people and all of the great things that we have in our county, and then, more broadly, throughout Indiana,” Kirkwood said. Elicia Feasel, executive director of the Historic Preservation Commission of South Bend and St. Joseph County, has overseen a few of South Bend’s Legacy Projects for the Bicentennial. Building South Bend: Past, Present and Future was done in partnership with the Hesburgh Libraries of Notre Dame’s Architecture Library, the History Museum of South Bend and the Historic Preservation Commission of South Bend and St. Joseph County. The project, which has an app and website, aims to show the then and now views of South Bend. “There are 3-D printed models of this three block section of downtown that we virtually recreated, and the 3-D printed models sit on a table and you can see how downtown was in 1927,” Feasel said. The 1920s was chosen as the theme for the celebration because Feasel and her team believed that this time period was highly significant to the history of South Bend’s completion. The project, which involved Notre Dame students, is still ongoing. “We [the Historic Preservation Commission] have a lot of files. These files live in drawers, so for us, it was a way to turn our files into life; essentially getting them out of the drawers and using them to create this free public resources that’s available anywhere in the world,” Feasel said. Building South Bend wasn’t the only project that brought archives of St. Joseph County’s history to life. Looking at St. Joseph County: A Traveling Photo Exhibit by Louis Sabo was another part of St. Joseph County’s bicentennial celebration. Sabo, a former photographer for the South Bend Tribune and artist, does not use modern equipment or processes for his work. About 200 of Sabo’s photos were discovered in the Commission’s file drawers. He has given one public lecture on the subject. Sabo expanded his region and traveled in the county for the bicentennial, and Feasel estimates he’s added 50 new photos to the collection for this year. There are pictures of buildings, construction and street scenes in the new photos. “There is a ton of construction happening in South Bend right now, and Lou is there documenting all of that,” Feasel said. The state of Indiana’s bicentennial commission reached out to the counties in 2015 to ask what they were going to do to celebrate the bicentennial. “We interpret that as ‘what was St. Joseph County’s contribution to the state and how does it relate to the state’s history?” Feasel said.